Although our sake shop has moved from the basement to our main food shop, it still boasts a wide selection of Japanese rice wine, plum wine, beer and spritzers. For one day only, we are offering a unique sake tasting experience of two premium quality wines. It’s free too, so there’s no excuse not to come along. Yuki no Bousha (Organic Junmai Ginjo) – This was the first ever sake made from organic rice in Japan. It has a well-rounded, elegant taste that is easy to drink and a fragrant aroma. Tenon Koshu (5 years) – This traditional sake has been aged for five years resulting in a mature, full-bodied flavour. 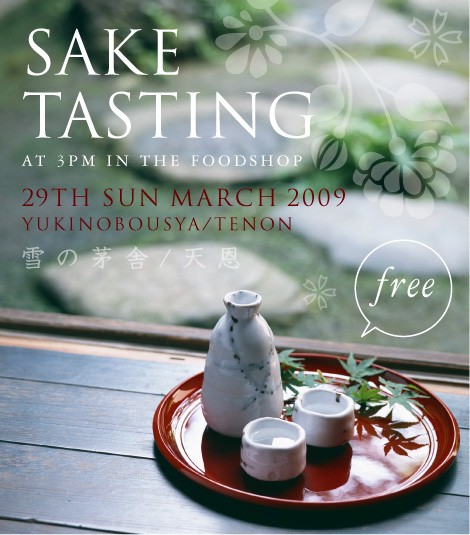 Taking place on Sunday 29th March from 3pm in the Japan Centre Food Shop, 213 Piccadilly. Posted in Food and tagged Sake. Bookmark the permalink.